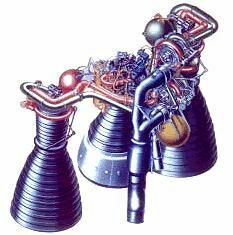 Rocketdyne LOx/Kerosene rocket engine. Atlas space launchers. Out of production. Atlas Sustainer. Gas generator, pump-fed. Evolved from MA-2 ICBM system. First flight 1963. Status: Out of production. Date: 1960. Number: 50 . Thrust: 386.40 kN (86,866 lbf). Specific impulse: 316 s. Specific impulse sea level: 220 s. Burn time: 266 s. Height: 2.69 m (8.82 ft). Diameter: 3.05 m (10.00 ft). Thrust (sl): 269.000 kN (60,473 lbf). Thrust (sl): 27,430 kgf. Engine: 460 kg (1,010 lb). Chamber Pressure: 48.00 bar. Area Ratio: 25. Propellant Formulation: Lox/RP-1. Thrust to Weight Ratio: 83.8297872340426. Oxidizer to Fuel Ratio: 2.27. Coefficient of Thrust vacuum: 1.77414206044677. Coefficient of Thrust sea level: 1.27414206044677. Country: USA. Launch Vehicles: Atlas Agena D, Atlas F/Agena D, Atlas H, Atlas G Centaur, Atlas I. Propellants: Lox/Kerosene. Stages: Atlas Agena SLV-3A, Atlas G/H/I. Agency: Rocketdyne.